Situated in a high quality residential area, just 8 minutes from the sea, in one of the most beautiful areas on the Spanish coast line, Villa Lyra is a perfect place to enjoy privacy and tranquillity. This villa is offered on a south facing 1000 sq. m parcel in Monte Olimpo, an urbanization that provides convenient access to all the amenities the area has to offer. Villa Lyra is a 2 storey bright, modern 3 bed 3 bath villa. The main level is a modern open concept living, dining and kitchen with one full bedroom and en-suite bathroom. This level is bright and spacious with large windows that open to the sunny terrace, garden and pool. The second level has two more bedrooms with ensuite bathrooms and private terraces. Villa Lyra is offered with quality construction and attention to detail. It includes beautiful finishes, stylish fittings, complete kitchen, integrated wardrobes, plus all terraces, gardens and pool. The concept is designed to be easy to maintain and will be delivered turn key, completely finished and ready to enjoy. 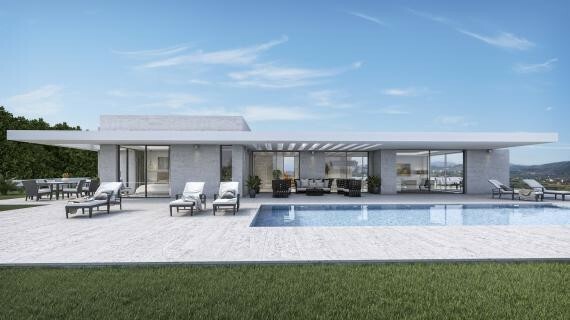 Perfect for a holiday home in Spain or first residence, where you can make the most of your time enjoying the sunny days, and relaxing lifestyle, that Spain has to offer.